11 and 13, Naukova str. Physical and Technical Faculty of Dnipro National University was organized in 1951 with the purpose of preparation of specialists for the enterprises of space industry. In the first years of its activity the primary goal was to provide the enterprises of rocket and space industry of the country with highly educated personnel who meets the challenges of designing, manufacturing and operation of rocket launch industry. 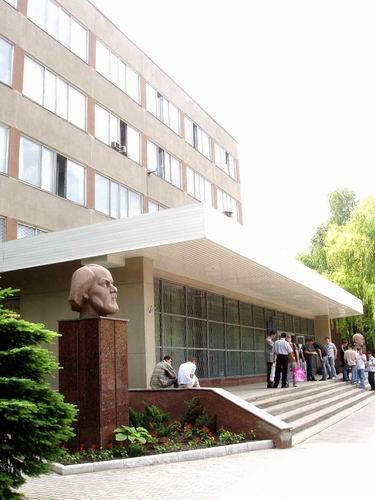 The traditional places of employment of graduates of the Faculty were the following: State Design Office "Yuzhnoe", Production Union "Southern Machine-Building Plant", Institute of Engineering Mechanics of the Academy of Sciences of Ukraine and National Space Agency, Engineering Technology Research Institute of Machine-Building and others. Education in traditional areas of training by Physical and Technical Faculty meets modern trends of projecting, manufacture and operation of launch vehicles and spacecrafts. The Faculty introduced new disciplines and specialties related to the development and introduction of space technologies of satellite communication services, processing and protection of information in space science and so on. The knowledge of graduate students enable them to solve complex technical problems, work in enterprises, which do not limit themselves with issues of the space industry only. Their knowledge had to do with development of new materials and technologies for production, automation of technological processes, information security, creating of robotic systems and technical systems, solving problems of highly efficient energy and others. Over the years the Physical and Technical Faculty gave education to thousands of professionals. Faculty trained many talented designers, engineers, scientists, distinguished space industry of the country, including: L. Kuchma - President of Ukraine (1995-2005); V. Gorbulin - Advisor to the President of Ukraine; V. Comanov - Deputy General Designer of the State Design Office "Yuzhnoe" in the project of "Sea Launch", Hero of Ukraine; Yu. Alekseev - Director General of the National Space Agency of Ukraine, Hero of Ukraine; S. Konyukhov - General Designer of the State Design Office "Yuzhnoe", Academician of National Academy of sciences of Ukraine, Hero of Ukraine; V. Pilipenko - Director of Pridneprovsky Research Center of National Academy of sciences of Ukraine, Academician of the National Academy of Sciences of Ukraine, Yu. Semenov - Director General of NPO "Energia" (Russia), National Academy of sciences of Russian Federation, O. Makarov - General director of "Ukrkosmos". Physical and Technical Faculty works in close cooperation with the National Center for Youth Aerospace Education of Ukraine, which coordinates the nationwide youth projects in the aerospace industry, which actively involves students and postgraduate students of Physical and Technical Faculty. Such cooperation provides opportunity for young scientists to get experience in conducting research. Dean of the Faculty - Petrenko Alexander Mykolayovich, PhD, Professor, Honored Worker of Education of Ukraine. Dean of Academic Affairs for senior students - Sidorov Olexiy Anatoliyovich, Ph.D., senior lecturer. Dean of Academic Affairs for junior students and in the issues of educational work - Haschyna Alexander Ivanovich, Senior Lecturer. Deputy Dean for Research and international activities - Aschepkova Natalia Sergiivna, candidate of technical sciences, docent. - Development of combined technology controlled by rolling followed by heat treatment in the furnace in order to improve the properties of rolled products and natural gas saving. - Chemical technology of fuel and combustive materials. The Faculty publishes three collections of scientific overalls that are included in the list of the Higher Attestation Commission as professional ones, "Journal of DNU. Rocket and space technology","Issues of high-temprature equipment", "System design and performance analysis of aerospace technology". The teachers and Faculty researchers are actively working on the educational process with literature. Over the past three years, the experts of Physical and Technical Faculty published 7 books, 67 teaching and learning aids (including 8 with the stamp of the Ministry of Education and Science of Ukraine). - Hashachyh A.D., Sholyn M.K. Autogeneration methods and instrumentation for non-dectructive control of quality of tires and rubber products. - Belozerov V.E., Volkova S.A. Neometric approach to the problem of stabilization of control systems. Achievements of scientists and academicians of the Physical and Technical Faculty received high state awards. Since the independence of Ukraine the Representatives of the teaching Faculty have received 8 awards and 3 medals. For fruitful activity in matters of giving young people a quality education and academic achievement, the representatives of Physical and Technical Faculty were given the honorary title of Honored Worker of Education (5), Honored Scientist of Ukraine (5), the Excellence in Education of Ukraine (4). Students take active participation in the research work carried out at the Faculty. The results of their research works are published in articles, theses and conference materials. Traditionally Physical and Technical Faculty students became involved in the International Youth Scientific and Practical Conference "Man and Space" pursued Dnipropetrovsk National University with the National Center for Aerospace Education Youth Ukraine. In 2009, more than 75 papers presented at the conference by students of the Faculty, 23 of them awarded diplomas for the best report, 10 were recommended for publication in the scientific journal "Herald of the DNU. Rocket and Space Technology." Students of the Faculty participate in international conferences "University microsatellites - Perspectives and Realities", "Environmental problems in the Regions of Ukraine", " Ecointellegence 2007". Student theses are awarded with certificates and diplomas for high-level research. At the Physical and Technical Faculty there is the student design bureau. Students of the Faculty are involved in the creation of Ukrainian youth satellites UMS UMS -1 and 2, as well as student nano-satellite of Physical and Technical Faculty. Physical and Technical Faculty implemented international educational programs. Positive experience gained with exchange programs of students and graduate students in Physics and Engineering of the Faculty of Dnipropetrovsk National University and the University of La Sapiensa (Rome , Italy). In recent years, developing international contacts with Middle Eastern Technical University (Ankara , Turkey), the Department participates in the international program ERASMUS MUNDUS mobility of teachers, researchers and students from universities in Turkey. The work on joint projects in the academic field of aerospace education of the Eurasian National University (Astana, Kazakhstan). In July 2006, the representatives of Dnipropetrovsk National University, State design office "Yuzhnoe" and the Middle Eastern Technical University signed an agreement for the joint implementation of the project on the development and research of liquid rocket engine space purposes. Since 2007, the project has began. Scientists of the Faculty have fruitful cooperation with the Center for Magnetism at the University of Cardiff, UK. During 2008-2009, Dnepropetrovsk National University initiated contacts with the Federal University of Brasilia (Brazil) on the direction and content of cooperation in educational, scientific and humanitarian spheres. December 16, 2009, is the official signing of the Agreement between the Dnipropetrovsk National University and the University UnB. The process of signing was attended by Rector Prof. of DNU Polyakov M.V., Dean Prof. of Physical and Technical Faculty A. Petrenko, Rector Prof. UnB Jose Herald, Professor UnB Carlos Gurgel , Ambassador of Ukraine to Brazil Lakomov V.P., Director of the National Space Agency of Brazil. Dnipropetrovsk National University invited to cooperate with UnB to organize at the University Aerospace Department, which has become the basis for the development of rocket and space education in Brazil. University top management pays great attention to the construction of the new campus of the University - Gamma, which is planned in the near future to create an aerospace department. UnB University top management is confident that cooperation between universities support the development of cooperation between the countries. Student life of the Faculty is subject to the principles of student government. The main body of the student government is Council of the students. Institute students spend leisure time together, with fun, interesting and informative activities. Every year students are celebrating the Day of the Faculty, which is tied to the Day of Cosmonautics. Traditionally, the department organizes the annual Miss and Mister Faculty contest. Fun and rewarding event becomes Freshman Day. Carrying out of this festival aims to give young people who just started learning at the Faculty the opportunity to learn more about the Physical and Technical Faculty, communicate with teachers and advanced students, feel the real fun, creative, friendly atmosphere, meet interesting features of student life. Not only freshmen, but also senior students have a great pleasure to participate in this celebration. Prominent feature of student life at Physical and Technical Faculty is its own newspaper. The true student government mouthpiece, mean of information to support student life became interesting, sometimes uncompromising, it is the newspaper "FiztehiYa" ("Faculty and me"). All members of the editorial board are students. The newspaper says about news and events at the Faculty, raises and analyzes acute problems, publishes opinions of students and teachers, offers interviews and a lot of interesting useful information. The students of Physical and Technical Faculty have created photo-and-movie lab. Thanks to the creative interests of groups of students, Physical and Technical Faculty formed and updated photo archive, created two films, which include unique materials. Students of Physical and Technical Faculty are always enthusiastically involved in sports. They are active members of faculty, Interfaculty and interuniversity competition, where they often take the first places. The best students of Physical and Technical Faculty who successfully combine excellent learning, research work and active participation in the groups, are awarded with scholarships. Every year the best students receive scholarships from the Fund "Ukraine" , headed by L.D. Kuchma. Talented young people who achieved significant success in learning and research work, are supported by leading companies within the industry - they pay scholarships to the future employees.